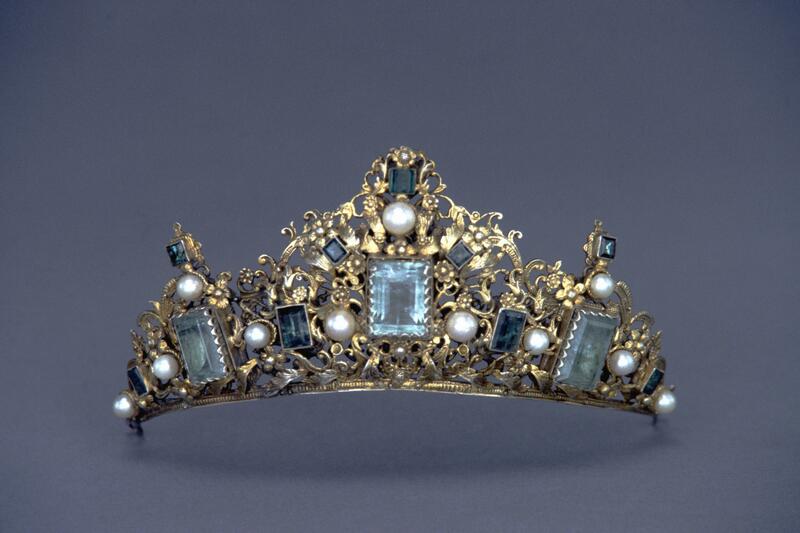 This delicate tiara, made of gilded silver and emeralds, probably once graced the statue of a saint. 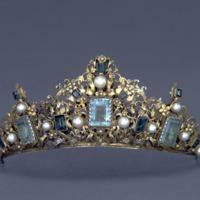 The tiara comes from Colombia, and measures approximately 14.5 x 9 cm in size (ca. 6 x 3.5 inches). Its miniature size, as well as its precious materials, required a very fine craftsman’s eye. Emeralds were abundant in Colombia, where this piece was made and their grass green color is prized to this day. Softer than diamonds, emeralds often have veins and fissures running through them. The emeralds in this tiara were cut using only a few facets to highlight the color of the stone, rather than to sparkle in the light. Pearls were often combined with emeralds in high-end silverwork made in Colombia and they enhanced the luster (and expense) of the object. The gold plating is also characteristic of the region. In other parts of Spanish America where gold was scarce or unavailable, silver was used alone for objects such as this one. Both in churches and elite households in the 18th century, dressed statues of saints were common. Jewelry was used both as adornment and as an index of devotion of the individual, cofradía, or parish that commissioned the work. The maker of the tiara first fashioned it in silver, then plated it in gold, a metal available in Colombia, where the piece was made. Emeralds and pearls were then inset. Statues bearing adornments like this were set out in the public spaces of a church, and meant for contemplation. A wide public in Spanish America would thus have seen, and been familiar such luxury items even though only wealthy individuals or church organizations could afford to sponsor such commissions. Oribes y plateros en la Nueva Granada. 1990. Bogotá, Colombia: Banco de la República. Kennedy, Alexandra, ed. 1992. Barroco de la Nueva Granada: Colonial Art from Colombia and Ecuador. New York: Americas Society. Lane, Kris. 2010. Colour of Paradise: the Emerald in the Age of Gunpowder Empires. New Haven: Yale University Press.